While polls continue to show a slight electoral advantage for Hillary Clinton, Donald Trump is crushing her on Twitter. Does the social-media platform know something pollsters don’t? In 2012, along with the popular vote and electoral college, Barack Obama won the social-media election going away. On Twitter, the sitting president had 22 million more followers than his Republican rival, Mitt Romney. On a per-tweet basis, Obama garnered nearly twice as many retweets as Romney and many multiples of Romney’s likes. Obama’s mastery of the medium was lauded as evidence of a forward-thinking leader adept with technology, who resonated with millions of Information Age voters. While Obama clearly outpaced Romney on Twitter in 2012, the 2016 race shows that Donald Trump is absolutely crushing Hillary Clinton. More strikingly, Clinton’s numbers are similar to Obama’s in terms of retweets and likes per post — which makes Trump’s dominance even more remarkable. Much of Trump’s relative Twitter success is because of his ability to shape language in a way that elicits emotions, both positive and negative. Scott Adams, the creator of Dilbert, has spent the past year writing extensively on Trump as a “Master Persuader.” His work is required reading for anyone seeking to truly understand Trump’s rise. The persuasion techniques identified by Adams are strewn across Trump’s Twitter stream — and their quantitative impact is easy to see. Years before running for president in 2016, Trump was already an active Twitter user, earning a remarkably engaged followership. For instance, his 2014 tweets giving relationship advice in the midst of the Robert Pattinson-Kristen Stewart breakup gained notoriety — and immense engagement. He has continued with the same techniques, most notably self-authoring many of his tweets, putting him in a distinctly different category than most political candidates. While not scientific and hardly watertight, a quantitative analysis of a recent five-day period on Twitter -- Sept. 16 to 20 -- shows the magnitude of Trump’s Twitter lead. Furthermore, by looking at the same dates in 2012, the dominance is even more apparent. The handles used in the analysis were @realDonaldTrump, @HillaryClinton, @BarackObama and @MittRomney. It should be noted that Twitter evolved a great deal between 2012 and 2016 — most notably in the number of users regularly using the heart-shaped “like” function for tweets — so a true apples-to-apples comparison is difficult. That said, the “like” function was still very much used, as is evidenced by one Obama tweet in particular. Between Sept. 16 and Sept. 20, 2012, @BarackObama sent out a total of 36 tweets. On average, 2,550 people retweeted each post, and 1,700 “liked” the posts, with a standard deviation of 4,620 and 5,600 respectively. Much of this standard deviation is attributed to a tweet directly responding to Mitt Romney’s infamous “47 percent” comment — that tweet alone had 28,000 retweets and 29,000 likes. The next most popular Obama tweet garnered 5,600 retweets and 2,500 likes. In total, the 36 tweets gained 91,860 retweets and 44,320 likes. Romney lagged far behind. His campaign put forth 14 tweets in the period, averaging 1,250 retweets and only 250 likes per tweet, with a standard deviation of 1,260 and 290. The most popular Tweet gained 5,400 retweets and 1,200 likes. His 14 tweets elicited a total of 17,520 retweets and 3,510 likes. Romney had about one-half to one-quarter the engagement of Obama. This may be due to a disparity in follower numbers, but that disparity in and of itself is an indication of overall engagement and an approximate proxy for popularity (while acknowledging that a “follower” isn't necessarily a supporter or a fan). 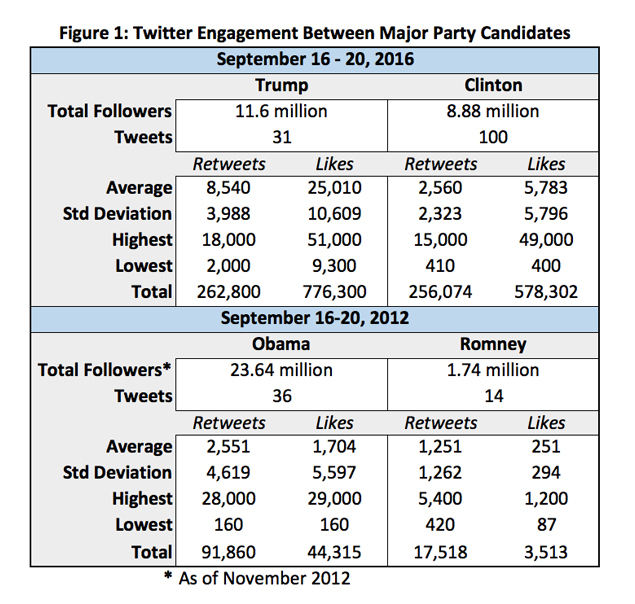 The 2016 election has seen far more engagement on Twitter than 2012, both in quantity of tweets and overall follower engagement. For example, Trump’s 31 tweets have elicited nearly 18 times more “likes” than Obama’s 36 tweets over the same period, and Trump has less than half the number of followers Obama had at the end of election 2012. Even Clinton has outpaced her onetime rival, with nearly three times as many retweets and 12 times as many “likes,” although she only has one-third the followership. When it comes to the sheer number of tweets, Clinton and her campaign are the clear winners — but quantity can’t replace quality, defined by user engagement. In the observed five-day period, Clinton sent 100 tweets (a few retweeted from other users, most notably Bernie Sanders). While her engagement was on the order of Obama’s (despite Clinton having far fewer followers), it paled in comparison to Trump’s engagement metrics. Clinton averaged 2,560 retweets and 5,780 likes. Her most popular tweet gained 15,000 retweets and 49,000 likes — and it was a post congratulating her "Saturday Night Live" doppelgänger for winning an Emmy. In short, the most popular tweet she sent involved a parody of herself. Of her seven most popular tweets by “likes,” one was an Obama video, two featured only Sanders and another actually retweeted Trump. Her 100 tweets had a total of 256,070 retweets and 578,000 likes. Now for @realDonaldTrump. He sent 31 tweets in the five days surveyed. He averaged 8,540 retweets and 25,010 likes. His most popular tweet gained 18,000 retweets and 51,000 likes. He also had tweets with 43,000 likes, 40,000 likes, two with 39,000 likes, and 38,000 likes. He had remarkably robust and consistent engagement. Removing his most popular tweet(s) barely moves his retweet or like averages — which cannot be said of either Clinton or candidate Obama. Even his least popular tweets — simple announcements about specific times he would appear on Fox News — gain more engagement (2,000 retweets and 9,300 likes) than the vast majority of Clinton’s substantive posts. Furthermore, we have two direct comparisons of similar tweets between Clinton and Trump, sent around the same time. The first celebrates the birthday of the U.S. Air Force — Trump gained 11,000 retweets and 51,000 likes, while Clinton garnered 1,500 retweets and 4,600 likes. That's an order-of-magnitude difference. Engagement demographics may account for this disparity if one assumes Trump followers are more inclined to care about the military, yet it also highlights the narrative challenges Clinton has when trying to convince the electorate she is a better commander-in-chief. The second pair of tweets concern the three terror attacks that occurred that weekend. Trump’s message of sympathy gained 16,000 retweets and 51,000 likes, while Clinton’s outrage related to the “apparent terror attack” in Minnesota elicited 2,700 retweets and 7,200 likes. Trump is not just winning the Twitter battle, he is routing his opponents -- both now and previously, during the Republican primaries. The question is: Does this matter for the election in general, and does it portend a surprise for the pundits who have, to this point, largely dismissed his chances? In 2012, many credited Obama’s victory to his sophisticated get-out-the-vote effort and social-media savvy. On the latter element, Trump quantitatively outpaces even Obama. Perhaps there is something happening behind the scenes that isn’t fully reflected in polling. If nothing else, this highlights what works for the various candidates on social media: for Clinton, posts that highlight her onetime opponents Bernie Sanders and Barack Obama. So too do posts that talk about veterans and succinctly attack Trump. Unfortunately for Clinton, specific policy proposals and quotes from the candidate herself tend to drop engagement. While Trump has a comparative paucity of posts compared to Clinton, they get much more bang -- sometimes an order of magnitude more. Shooting from the hip and insulting people increases engagement. Highlighting popular groups like law enforcement also moves the needle. Compared to Clinton, Trump actually had far fewer direct attacks against his opponent, but they often gained significant traction. Even his mundane TV-appearance announcements get more engagement than many of Clinton’s substantive posts. Stylistically, Clinton’s tweets seem far more crafted and traditionally strategic, compared to the raw, off-the-cuff and flamboyant style of her opponent. Yet the latter technique drives far more user engagement and passion. Political social-media strategies try to influence the largest portion of the electorate, and overall engagement is a relevant quantitative indicator for success. At least at the moment, it’s clear which method of communication is having the most impact. This disparity on Twitter may have many explanations unrelated to the ultimate electoral outcome in November. If the election does turn out to be a Trump victory, however, his performance on Twitter will only highlight the persuasive juggernaut that propelled him to the White House. If he loses, well, his brand has an engaged and energetic following that will likely remain for whatever he chooses to do next.